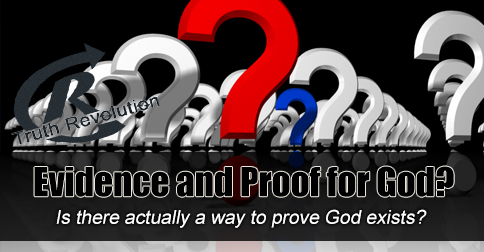 Is there actually a way to prove God exists? [audio:http://www.truthrevolution.tv/show/TS-0305.mp3]No Flash Support? Use this Audio Player! Dave: Can we actually PROVE God exists or that Jesus rose from the dead? Dave: BINGO! In one way, a scientist must prove his theory. Until there is great evidence, or other options have been explored, he hasn’t proven anything. Jeff: Then there are mathematical proof. You know, a super-basic example is 1+1 = 2. Dave: We can prove that is true with absolutely zero doubt. Jeff: But then another way to see it is with logic: a lawyer must prove his case. Dave: Does the jury ever have doubts? Is there any contrary evidence? Anything that makes a juror scratch his head? Jeff: Yeah, of course! But, they still have to ask which lawyer proved their case!